The Republic of Equatorial Guinea strengthened bilateral ties with South Sudan by signing a Memorandum of Cooperation to support African oil and gas. Equatorial Guinea will lend its extensive experience and resources, including oil and gas licensing rounds, gas monetization and flaring elimination, investment in power plants, and personnel training, to further develop South Sudan’s oil and gas industry. The Memorandum will strengthen ties between the two countries, including exchanging information on policy and regulation, promoting upstream, downstream, and infrastructure projects, and collaborating between the two national oil companies, GEPetrol and Nilepet. Equatorial Guinea’s Minister of Mines and Hydrocarbons and South Sudan’s Minister of Petroleum signed the Memorandum. Equatorial Guinea is set to close the EG Ronda 2016 licensing round, which will officially conclude in June at the Africa Oil & Power 2017 conference in South Africa. The Republic of Equatorial Guinea hosted a training seminar for civil society organizations and professionals aimed at sharing the tools, methods, and mechanisms of civil society organizations, in an effort to improve efficiency and further develop sustainable governance. The seminar hosted professionals from Equatorial Guinea and Gabon, who learned about viable instruments regarding civil society over the course of five days at the Hotel Ibis in Malabo. The second phase will take place in Libreville, Gabon on 24 April. The Hotel Ibis in Malabo has hosted events such as this in the past, with world-class facilities, including business and meeting rooms, and the latest technology such as high speed Wi-Fi internet access and flat screen televisions. 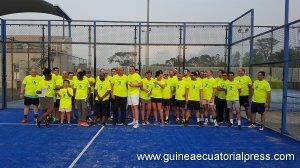 The Republic of Equatorial Guinea hosted the III Padel Tournament at the Cano Sports Complex in Malabo. The tournament included 36 athletes from all over the world competing at the highest level of the racquet sport. The world-class sports complex in Malabo has hosted the African Cup of Nations, and includes a football and athletics stadium which can seat over 15,000, as well as an Olympic swimming pool and running track, among other facilities.